Interior of the Naim Sapphire Condominium Deluxe show unit. Naim’s The Peak show unit. 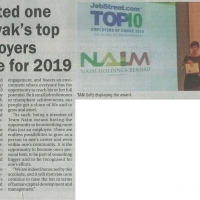 KUCHING: Naim Group of Companies (Naim) two award-winning developments continue to receive encouraging response from the public. 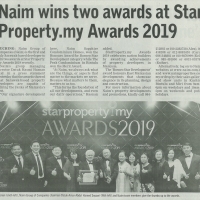 Naim Sapphire Condominium Homes here emerged as the Honours Award recipient in the Star Property.my Awards 2019, whereas Naim The Peak Condominium Homes in Bintulu clinched the Merit Award. 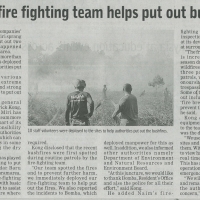 Members of the public have expressed their fascination and interest in the two developments, according to a press statement released yesterday. One of Naim Sapphire’s visitors, who wished to be known only as George, had said he was fascinated with the Deluxe tower’s new show units. “The design has made the show units look and feel spacious as well as modern. I’m impressed with the elegant design and attention to detail of their living rooms and bedrooms. This has taken condominium living up another level!” George enthused. Strategically located in the prime area of Batu Lintang, Naim Sapphire features more than 72,000 square feet of lifestyle facilities, including an Olympic-sized saltwater pool, a rooftop garden and an exclusive Residents’ Lounge. The take-up for its first tower, known as the Classic Tower, is currently at about 90 per cent, while its second tower, the Deluxe Tower, is now open for sale. Meanwhile, Naim The Peak is said to be “the complete package”. Another visitor, who wished to be known as Wong, had visited its show units and newly unveiled Recreations Deck and said there was plenty to like about the development. 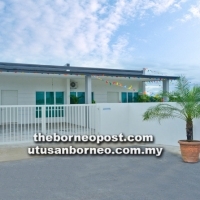 “With its strategic location within the heart of Bintulu town, great facilities and nicely-designed show units, I can imagine living on top of the world especially with this spectacular view from my unit,” Wong gushed. Naim is currently offering various flexible home ownership packages, such as ready-to-move-in, ‘Stay First, Buy Later’ and rental guarantee programmes for the benefit of its clients. 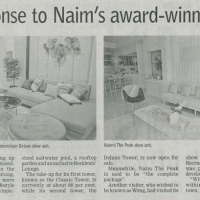 Members of the public who wish to know more about Naim’s property developments and promotional packages are advised to call 084-212881/010-2282738 (Alex), 082-416288/012-8881455 (Carol), 086-343881/010-9870999 (Kelly) or 085-491000/013-8337873 (Esther). Alternatively, log on to Naim’s websites at www.naim.com.my and www.naimproperties.com.my, or drop by Naim’s Sales Gallery and show units in Kuching, Bintulu and Miri from 9am to 6pm on weekdays and 10am-5pm on weekends and public holidays.